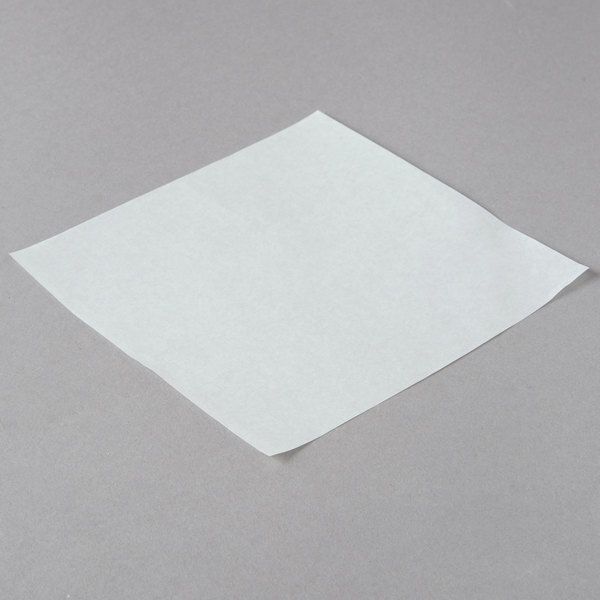 Help keep your deli items neat and separated in appropriate portions with this 5 1/2" x 5 1/2" patty paper! 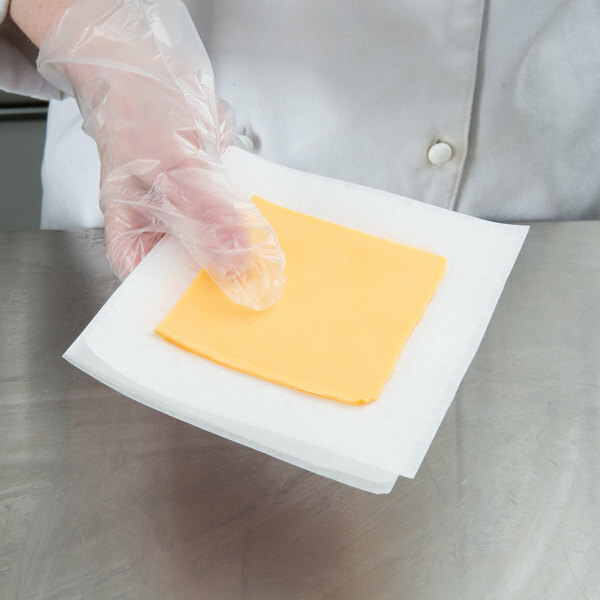 Made of standard weight waxed paper, this patty paper allows you to interleave individual sheets between hamburger patties, fresh meats, cheeses, and more! Or use it for picking up food items to keep the product sanitary and uncontaminated. Its waxed coating makes this patty paper grease-resistant and helps reduce juices and greases from leaking through. 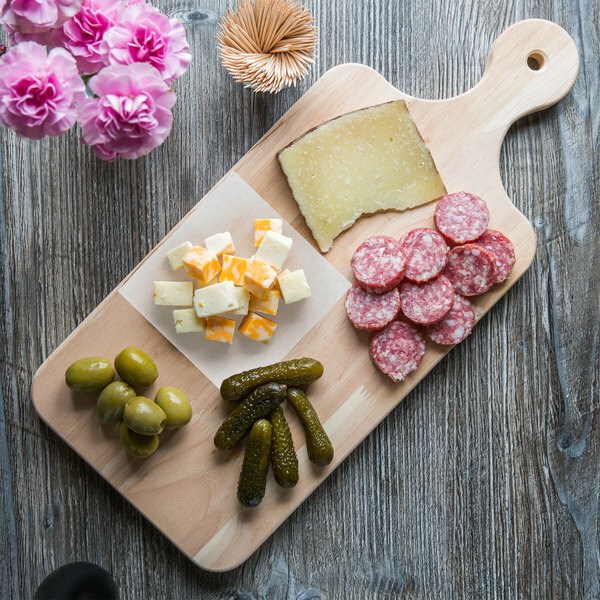 You can even protect and preserve the appearance of your cheese boards by using this paper as a liner. 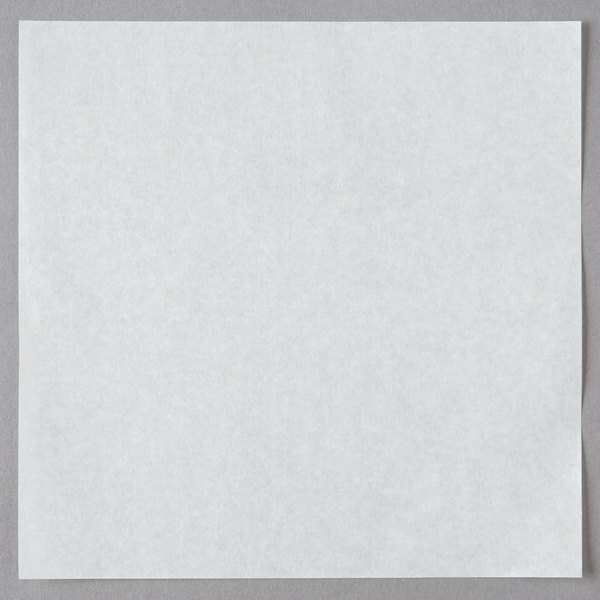 Perfect for a variety of foodservice applications, this patty paper is a versatile product to have in stock! Maybe you're operating a venue that outputs a large quantity of burgers daily. Use this patty paper on your hamburger press and conveniently and quickly form individual portion-sized patties that are already pressed to a sheet of patty paper. Or maybe you need patty paper for your deli or market. Whatever the case, these sheets are perfect for any burger joint, kiosk, concession stand, or snack shack. Use with day of the week product labels (sold separately), too and always know expiration dates and maintain food safety! Packaged in a convenient box, this patty paper is easy to access and dispense. Store it on your countertops, in a drawer, or on your back shelf. What's to say about these? Big enough to separate large burgers, cheap enough to use for small sausage patties. I keep these around in both my home kitchen, and my butcher shop. WAYYYY easier than trying to keep patties from sticking any other way I've found. I never want to be without these. They are a versatile product. They can be used for placing between burger patties but I use them for many things. These are great for placing between packaged cookies, for example. I also place one between each of my glasses dishes when I put them away. These happen to be the right size to cover my scale when I weigh out portions. I also use them to make hamburgers. They are so versatile I'm my kitchen at home. Will definitely order more when I am almost out. These papers work perfect foe separating the patties as they are made and placed in storage containers. They were a great investment and will be kept in stock. We have been buying this on and off for a year now. Have tried papers from other sources and always this 5.5x5.5 patty paper was the bench mark to measure against. Great product. We use these daily when making our burgers. They work exactly as expected and the pricing is very good. We will continue using them in the future. Perfect size to fit between two patties to make sure they don't stick together. Easily come off of frozen patties. They don't get soggy and rip when they get condensation on them from the fridge. We use these to separate flattened pieces of dough and often need to reuse them throughout the day. We find that after the first use they become more pliable as they get more moistened and the dough releases a lot more easily. These work well for our purposes because the dough doesn't stick too much and they're just the right size. perfect patty papers! these are great! the size and thickness are wonderful and hold up well in the freezer. we use them for more than burgers.good for portions of cheese etc. These papers were great. They were not the thin ones that food soaks into. I use them for patties and for putting between layers of cookies and cooked bacon besides patties. We use this patty paper daily to make our burger patties and separate them. The case or box they come in is great for dispensing and the price is just right. Great product. This is by far the best price I've found on patty paper. The dimensions fit nicely into our 5th pans and the paper itself is of high quality. THESE ARE WONDERFUL IF YOU MAKE YOUR OWN BURGERS AND NEED TO SEPARATE THEM. CAN BE USED FOR OTHER FROZEN ITEMS TO KEEP FROM STICKING TOGETHER,AND THE PRICE IS RIGHT. This patty paper is just as good as the ones we buy from our food vendors. It is cheaper from webstaurant.com when it is on sale. These patty paper are the best ever! The 5 1/2x 51/2 are perfect size for our patty press. I bought a box of 1000 and I wish I would have bought more. These patty papers work well for our hand pattied burgers. The little bit of wax coating that is on them helps to keep the paper from sticking to the burgers. The cost is better than getting through our food provider and they are almost the same product, though I think these are a little better. As a deli, these patty papers are vital to everyday operations! We put them in between meets and cheeses, use them to give samples to customers, serve our stromboli on them, and more. Very versatile, simple and useful. This patty paper works just as expected, it prevents patties from sticking to my patty press. If freezing patties for later, I add an additional sheet of patty paper between the patties to prevent them from freezing to each other. The 1000 pack lasts me a while, and the box makes a decent dispenser. This patty paper goes perfect with our patty press and will allow use to divide the days needs for fresh prep. And what isn't sold or over ground can be fzen in patty form. This patty paper has just the right amount of wax so that it keeps your burgers from sliding around or sticking together. The dispenser box sometimes gives us a bit of trouble, but you just have to use some common sense and take an extra few seconds to make sure that the paper will not come sliding out of the top all at once. This product is so economical that we can overlook occasional challenge with dispensing. I love love love these things. I've used thousands and thousands for my business, and I have not a single complaint. If I had to find something to be very picky about, I would say that sometimes if you're not careful once the box is open, the whole stack will end up on the floor. I'd like to see some small improvement to stop the whole stack from sliding out of the box. Other than that extremely small problem, these things are a life saver for my business. You can also use the Box of 1000 Durable Packaging 5 1/2" x 5 1/2" Patty Paper as liners for homemade tortillas so they don't stick together before you cook them. I love that you get so many for such a great price. I really like these. Thick enough since we use them to handle hot items and we don't get burned unless we keep them in our hands for a long period of time. The wax is just enough for our needs and you can easily grab them one by one without loosing time and wasting product..
We use these patty papers for our meat because we hand press our meat and they work good. Their cheap and an effective way to separate patties. I was so tired of cutting up parchment or wax paper to keep my homemade hamburgers separated. It was nice to find these precut forms. They work perfectly. Very good product! We bought these locally originally but were paying 2 to 3 times the price. Tried these to make sure they were the same product. Already reordered. Very well waxed to reduce number used. Just as the title states "Durable Packaging 5 1/2" x 5 1/2" Patty Paper" .We use them to patty both our jumbo and regular burgers. papers work like a charm. Use them for more than just making sausage or hamburger patties. When we buy other meats we use them for separation also.